Cubase SX, SL product review. Download music software, best price tips. Looking for guitar tab, sheet music or music instruction? Click here. Time marches on and Steinberg's Cubase has evolved. Found in a plethora of home and professional recording studios across the world, Cubase is a complete recording software solution. Producers, remixers and songwriters can compose and arrange their music, incorporate samples and loops and give their music the finishing touch with integrated effects. Cubase is the name in professional recording. Be it for the ambitious newcomer or the hi-end professional, for home recording or big-budget Hollywood soundtracks. There are good reasons why more and more musicians are deciding on Cubase: easy and really logical to use, it offers almost limitless professional possibilities. With its VST and ASIO interfaces, Cubase also boasts an exceptional level of flexibility. Be anywhere, whenever you want. Travel back in time to that perfect edit when everything was coming together. With Cubase SX you can 'rewind' to that precise moment in your arrangement where you now intend to develop on your original idea. This is the power of the unlimited undo/redo functionality in Cubase SX: time travel is now a reality in the virtual world. With Cubase SX you have total control of your final production, even if you have 'finished' the project. One of the great new features included in Cubase SX is the off-line processing of individual audio files which allows effects to be 'stamped' onto them layer after layer. The off-line process history lets you can jump back to any individual process such as a reverb and edit it, remove it or replace it with any other effect you desire. Automation adds flexibility and creative freedom to music production. 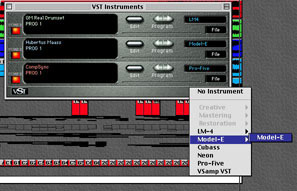 Included are three automation modes. Choose between Touch fader, Auto Latch and X-over modes - offers you even more choice in how you get your project sounding exactly the way you want it. Cubase has also added something special: now you can draw various waveforms and curves in the automation tracks. Not just for audio effects and volume, even MIDI controller data and MIDI notes can be automated in seconds. Cubase SX turns automation into an instrument you can play. Mixing is an art in itself. The mixer design in SX is an art in itself. To create your masterpiece you need an ergonomic interface, you need top-quality audio characteristics and you need flexible routing options. A brand new 32-bit floating-point mixer is now included, as well as comprehensive surround sound mixing and panning controls. So you can now mix any project to 5.1 surround format for DVD productions. And of course full mixer automation of every parameter is included. Included is a fantastic new analog virtual synthesizer powered by Waldorf in addition to a 24 Bit drum machine and a great-sounding bass synth. Cubase SX also features an extended range of high-quality VST virtual effect processors such as the SPL De-Esser and the QuadraFuzz distortion unit. Combined with the plethora of virtual effects currently available, the huge range of quality VST effects available as standard with Cubase SX almost overwhelm with creative potential. Cubase SX offers real-time MIDI plug-ins such as Quantizer, Chorder, MIDI-Echo, Compressor and many more. Most of them can be inserted while playing on your MIDI keyboard - a great source of inspiration. Just like any other parameter in the Cubase SX mixer, they can also be fully automated. This revolutionary new standard brings true connectivity and platform independence to the digital audio world. Not only does VST System Link harness the full CPU and disk power of several computers simultaneously regardless of platform, it will let you take your audio projects to new levels of complexity, and offers unbelievable flexibility in your working environment. Cubase Score VST has for many years been the industry standard software used for film soundtrack production and music education. This is because of its perfect integration of score-writing, sequencing and music production. Cubase SX includes all of the scoring and playback features of its older sibling. The amazing possibilities opened up by the new multiple undo/redo functionality are capitalized on in the scoring section. Now you can "throw the new manuscript in the bin" and return to the stage where you got it right, all in a matter of seconds - and audition exactly where you want to start afresh. Music production has never been more intuitive, more creative, and more powerful. Serious about your music? Cubase will help you achieve your goals. Although the learning curve is a bit different then that of Cakewalk Pro Audio, (another excellent music software package), once you know your way around the program it's a dream to use. Legions of musicians and producers swear by Cubase and use it as the main tool in their studios. One thing was foremost in the minds of the developers of Cubase, namely the creativity of musicians. Cubase offers professional functionality while allowing you to work absolutely intuitively. Copyright © CleverNet. All rights reserved.